Every workplace has its own cast of characters. The office jokester, the person who has the inside scoop, the workaholic, the guy who always offers to help, the person who manages to jam the copy machine every time. And at SANCCOB? The office character is 12-inches tall, demands three fish a day and honks if her demands aren’t met. 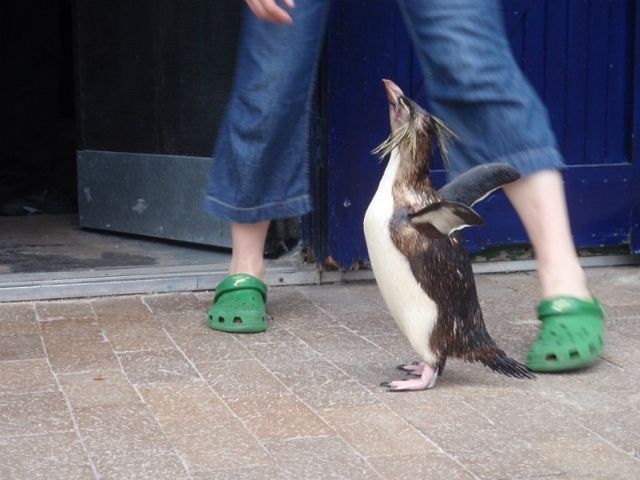 Yup, it’s Rockie, the Northern rockhopper penguin! 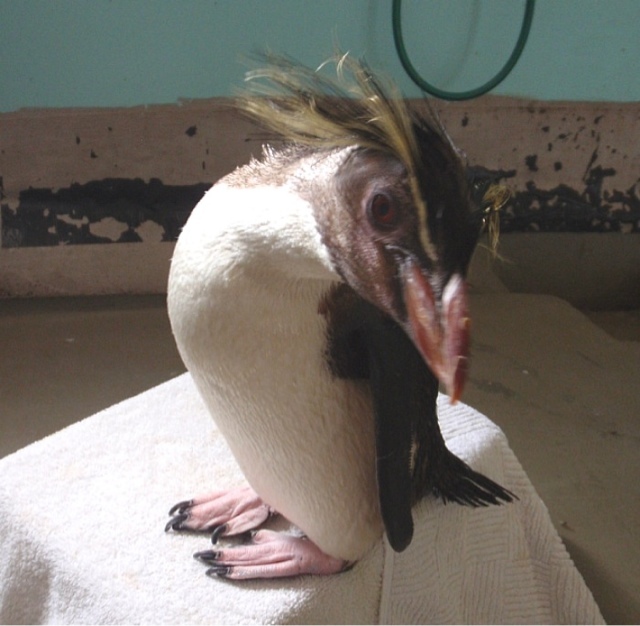 Though SANCCOB rehabilitates mostly African penguins, they do on occasion get rockhopper penguins that have been found on local beaches. Rockhoppers are not normally found in South Africa. However, the Northern rockhopper does occur on a group of islands to the south. It is from these islands that folks theorize that the rockhoppers may come from. If they catch an ocean current and take a left instead of a right, they can end up in Cape Town. It’s hard to say what Rockie’s origins are (and she doesn’t like to talk about the past) but the SANCCOB crew does know a little bit about her. She was admitted to SANCCOB in early 2009 after she was found on a beach near Cape Agulhas. She was able to be rehabilitated and is now approximately 4 years old (though she doesn’t like to talk about her age either). Her feathers are a bit ragged right now-she is getting ready to molt her feathers sometime in January! Because she was rehabilitated at the center and there isn’t a way to release her back home, Rockie found a permanent home at SANCCOB. She is part of the resident population but she earns her keep! Rockie has been acclimated to people so that she can participate in educational programs! 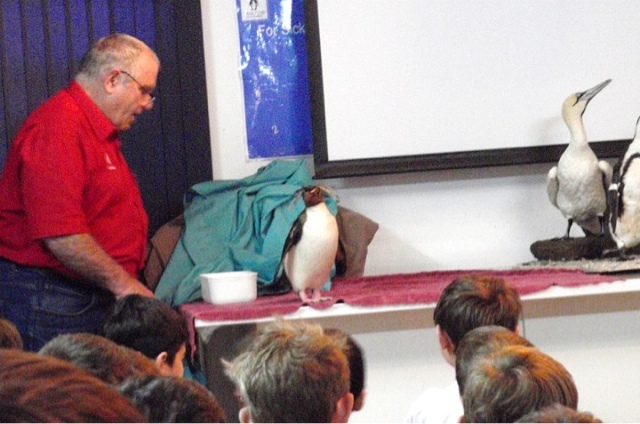 If school groups come to SANCCOB, Rockie is the star of the show. She is able to show the class how a penguin eats, how they walk and what they even sound like! 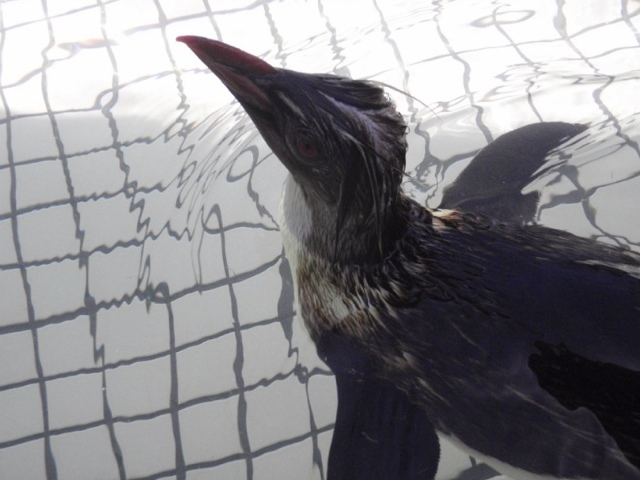 Rockie is also a favorite penguin at SANCCOB. Many times she will be left to roam the hallways, a good way for her to get some exercise as she hops from area to area. You never know—you may be walking to tea break and find her directing traffic! But watch out as you are going through the swinging doors, you may run into a rockhopper! Penguins have the right of way! 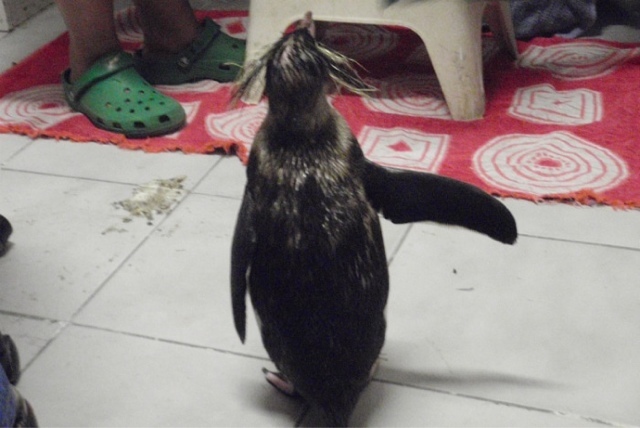 As cute as she is, Rockie is a reminder of great rehabilitation and educational work that SANCCOB is involved in. 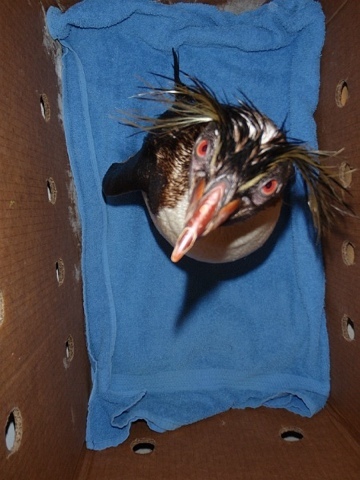 She also is a reminder that, as with the African penguin, Northern rockhoppers are listed as endangered and are facing major issues, such as oil spills and over fishing, in the wild. Groups like SANCCOB are doing their part but we all need to do our part to make sure these animals are around for a long time. Want to know how to help out? Check out the Aquarium’s Live Blue page to see how simple things we do in our own lives can make a big impact on the lives of others. Rockie will thank you! Have you done your part to live blue?